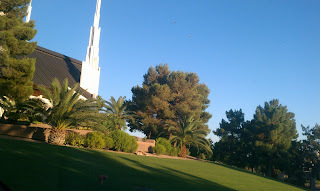 This last Friday Dean and I visited the Las Vegas LDS Temple. We walked the grounds and took pictures. 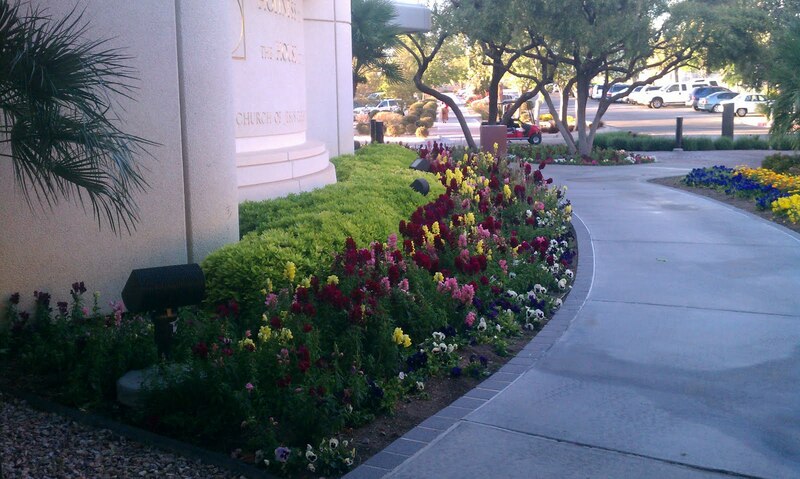 I love the beautiful temple grounds! 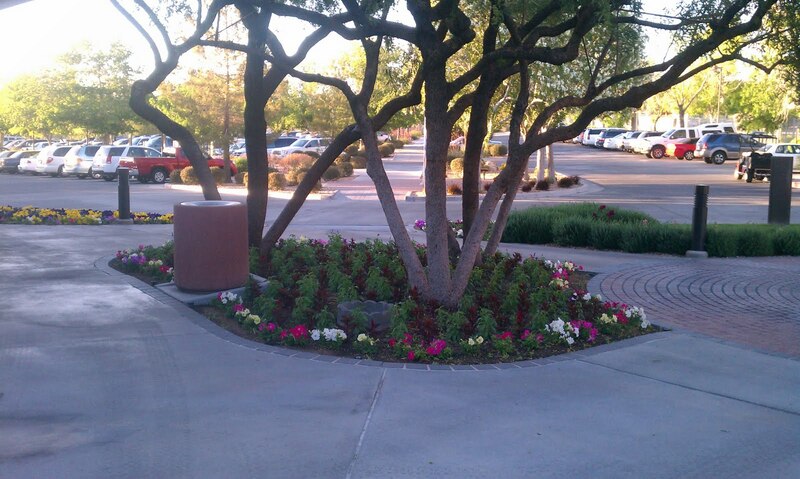 I haven’t spent a lot of time walking around the temple and I don’t think I’ve appreciated the tender care that goes into taking care of the beautiful flowers, trees, grass, etc. Below is some information about the Las Vegas Temple that I found on www.ldschurchtemples.com. Sitting on the eastern edge of the city—far from the glitz and glamour of the world-famous Las Vegas Strip—the Las Vegas Nevada Temple is a spiritual beacon in the City of Lights. The six soaring spires rising from the building echo the arresting red desert peaks of nearby Sunrise Mountain. Flourishing flowers and trees adorn the verdant grounds of the temple. 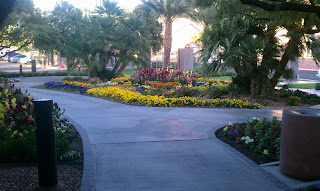 Visitors are welcome to walk the surrounding pathways to feel the peace that eminates from this sacred structure. 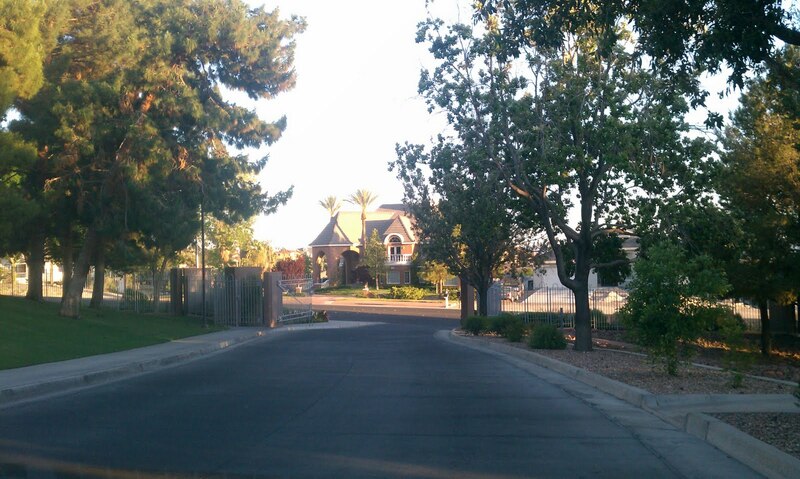 The Las Vegas Nevada Temple was the first temple built in Nevada. Natural light streams through the breathtaking floor-to-ceiling windows of the Celestial Room of the Las Vegas Nevada Temple, projecting miniature rainbows on the walls. The Las Vegas Nevada Temple was announced concurrently with the Portland Oregon Temple, Toronto Ontario Temple, San Diego California Temple, and Bogotá Colombia Temple. Following the announcement of the Las Vegas Nevada Temple, members of the temple district were asked to contribute toward construction. They enthusiastically answered the call, raising $11 million—428 percent of their assessment. During the 23-day open house of the Las Vegas Nevada Temple, 297,480 visitors toured the edifice. More than 99,000 visited the missionary pavilion following their tour, and missionaries reported that teaching appointments tripled in the valley as a result of the temple's opening. Elder Boyd K. Packer said: "There are many reasons one should want to come to the temple. Even its external appearance seems to hint of its deeply spiritual purposes. This is much more evident within its walls. 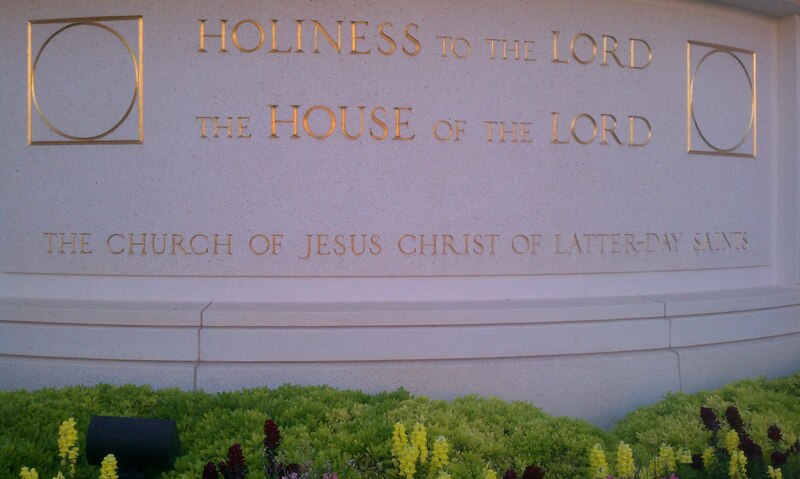 Over the door to the temple appears the tribute "Holiness to the Lord." When you enter any dedicated temple, you are in the house of the Lord." 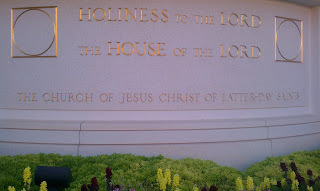 Russel M. Nelson said, "Inscribed on each temple are the words “Holiness to the Lord.” That statement designates both the temple and its purposes as holy. Those who enter the temple are also to bear the attribute of holiness." There are great pictures in the Photograph Gallery on the same website previously mentioned. 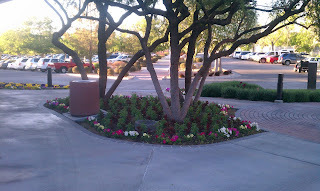 The pictures on this blog are ones that I’ve taken. I was privileged to be part of the temple open house before it was dedicated as one of the ushers/guides as people walked through and viewed the different areas of the temple. I was also able to sing in the choir at the dedication. What an honor that was! If you’ve never been able to visit a temple as part of an open house or attend a dedication, I encourage you to be able to do that some day. Whether we can go through the temple as an endowed member of the church or if we can only visit the foyer and the temples grounds, I feel everyone will be blessed by visiting the temple.